These extensive concrete remains lie just North of the current SSI Blast Furnace. 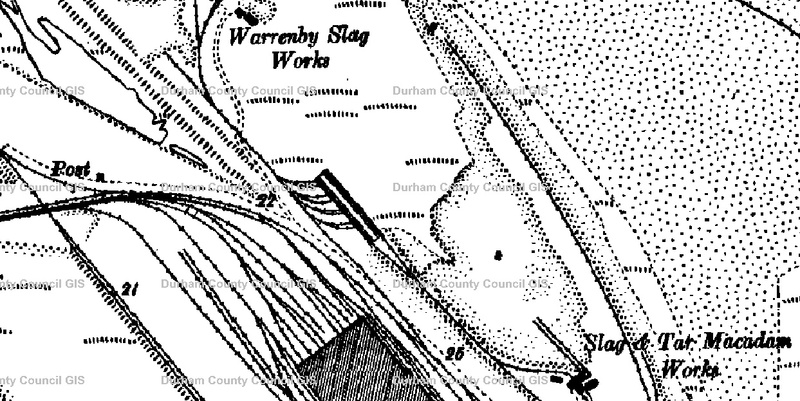 A post war map shows this structure between the Warrenby Slag Works and the Slag and Tarmacadam Works. To me the layout of rails and concrete blocks suggest a row of storage hoppers which rail waggon could be driven underneath for loading, although i’m yet to find an old picture of what was actually here. The 265m long French aircraft carrier Clemenceau arrived on the Tees on Sunday 8th Feburary 2009, drawing a very large crowd at South Gare. It was towed from Brest by the tug Anglian Earl which moved it into position to be dismantled by Able UK on the North bank if the Tees.